Mosul, as so much of Iraq, has suffered unimaginably under ISIS – but it is hard to spot the difference from how Iraq suffered under the US and UK (and are again.) The US bombed the city during the 2003 invasion, murdered Saddam Hussein’s two sons and fifteen year old grandson there in July 2003 – no Judge or jury, just US ISIS style summary executions – as across the nation. Destruction – a “Partial” List. *Many government buildings have been destroyed. U.S. officials told USA Today, attacks are often conducted at night to minimize civilian casualties, but security guards and civilians in neighboring buildings have of course been killed. *Telephone exchanges have been systematically bombed and destroyed. *Two large dairies were bombed, killing about one hundred civilians and wounding two more. *Multiple daytime air strikes on Mosul University on March 19th and 20th killed ninety two civilians and wounded one hundred and thirty five, mostly faculty, staff, families and students. Targets included the main administration building, classroom buildings, a women’s dormitory and a faculty apartment building. *50 civilians were killed and 100 wounded by air strikes on two apartment buildings, Al Hadbaa and Al Khadraa. *A mother and four children were killed in an air strike on a house in the Hay al Dhubat district of East Mosul on April 20th, next door to a house used by Islamic State that was undamaged. *Twenty two civilians were killed in air strikes on houses in front of Mosul Medical College. *Twenty civilians were killed and seventy wounded by air strikes on the Sunni Waqif building and nearby houses and shops. *U.S. air strikes on April 24th damaged the Rashidiya water treatment plant in West Mosul and the Yarmouk power station in East Mosul. *Banks and a bottling plant were bombed, more dead and maimed. *An air strike on a fuel depot in an industrial area ignited an inferno with 150 casualties on 18th April. *Bombs have damaged a food warehouse, power stations and sub-stations in West Mosul, and flour mills, a pharmaceutical factory, auto repair shops and other workshops across Mosul. “The 1st Marine Division fired a total of 5,685 high-explosive 155mm artillery rounds during the battle. The 3rd Marine Air Wing (aviation assets only) expended 318 ‘precision’ bombs, 391 rockets and missiles, and 93,000 machine gun and cannon rounds. 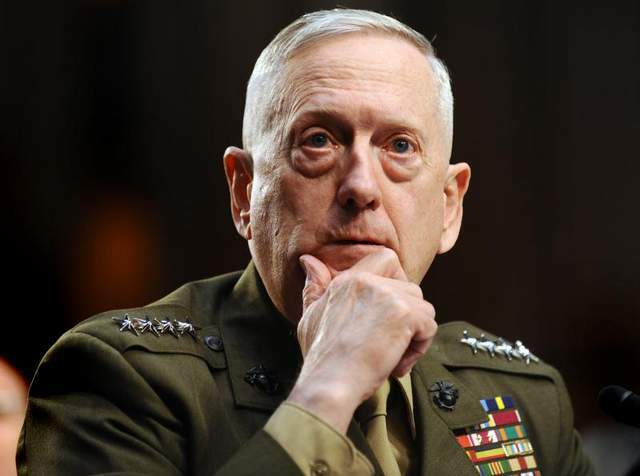 Mattis knows a bit about “annihilation tactics”, he headed Camp Pendleton’s Ist Marine Division in Iraq which were integral to the massacres in Fallujah in April and November 2004. 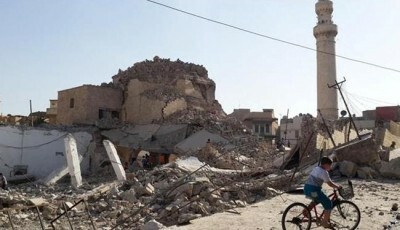 On 27th May the US had dropped leaflets telling people to leave the Old City, Mosul’s ancient heart, a city referred to as Al Fayha (the Paradise) and the “Pearl of the North.” US forces however, care as little as ISIS for life, limb or the Middle East’s haunting Pearls and Paradises. “Two of my mother’s cousins houses in Thawrah area were bombed three days ago. Fourteen family members died. Four women, eight children the oldest is ten, and two men. People reclaimed seven bodies and other seven still under rubble. They couldn’t save any survivor under the rubble because the bombings are still going on intensively on the area. “Those are my relatives and I know very well that they have nothing to do with IS. “People ask me: Why do I get so angry? “Below is a scene today from Mosul, my home town. 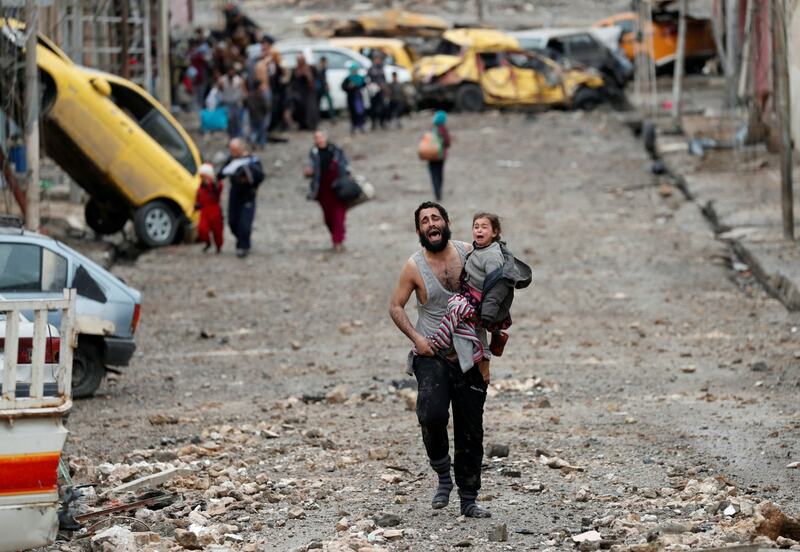 It is a scene repeated a thousand times over, all around Mosul. Yesterday the U.S. Air Force undertook 158 bombing missions over the city of Mosul. Every bridge across the Tigris in Mosul is now destroyed, the Sugar Factory has been bombed, a 5-Story medical centre has been demolished, the entire airport has become rubble, much of the city’s infrastructure including water and electricity have ceased to function, the University of Mosul buildings have been leveled, thousands of homes have been rendered unlivable, and of course no one is counting the civilian dead and the refugees. “And all for what? To destroy the Islamic State? Is this the same so-called Islamic State whose factions have been supported, financed, and trained by the CIA over the past five years in order to bring about regime change in Syria? “Since 2003, the United States has bombed Iraq, Syria, Libya, Yemen, Somalia, Sudan, Afghanistan … and presently it has its eye focused on Iran. And yet, we have the gall and temerity to talk about the savagery and barbarism of the Mongolian hordes of eight centuries ago. On the Presidential campaign trail, Mark Halperin of Bloomberg asked Donald Trump, whether he would use nuclear weapons against ISIS. “Well, I’m never going to rule anything out”, replied Trump. Iraq is near destroyed on the Blair and Bush lies that Saddam had weapons of mass destruction. Trump does and it seems, is prepared to think the unthinkable. Will the UN, the relevant world bodies, the “international community” wake up, before it is too late, before a swathe of Iraq and Syria’s people are vapourised, with twenty seven centuries of history ?